The shopping in Bangkok is some of the best in the world, in fact, they have just about everything you could think of in the way of shopping. You can find high-end fashion, all the way to the low end “I ❤️ Bangkok” shirts. A number of travelers plan a trip to Thailand just to spend some time shopping in the Bangkok markets. If you are limited on time in Bangkok, then deciding which shopping market (or shopping mall) to go to is essential to finding what you are looking for, as well as saving you time and money in transportation around Bangkok. So we’ve have broken it down for you into an easy-to-follow google map, as well as providing a quick overview of each major shopping market and shopping mall. Ah yes, Chinatown in Bangkok. It is an interesting and fun place to shop in Bangkok. You will find a lot of knockoffs here, so if you are in search of that Coach purse you want to bring back to your hometown then this is the place to find it. Be safe walking through the crowds here at night, as there are lots of people and warnings everywhere for pickpockets. Not only is it popular to shop in Chinatown, but food is everywhere! This is a really popular place at night, and you can try many kinds of snacks and some great street food! Also make sure to try the food while you are here. In fact, one of our favorite street food cooks is here – serving up tasty dishes and putting on a bit of a “fire show” too. Getting There: Take a river boat to Ratchawong Pier and walk for about 5 minutes to the market. One of the biggest (and a bit overwhelming) shopping markets in the world is Chatuchak. I mean it is huge!!! This is where you are going to find a lot of knockoffs, but also some good quality clothes and trinkets. In fact, they probably have just about everything you could want here. But it takes time to walk through it all. Plan on spending most of your day here because it is HUGE! While the market is technically open on Saturday and Sunday, we were told that they begin setting up and selling on Friday night. However, we went on Friday night and found that most of the shops were still closed, or everything was a mess while they set up. Not really a good shopping experience, and we wasted a lot of time walking around to see closed shops. So we highly recommend going on Saturday or Sunday. This is a very busy market for both locals and tourists, so be safe and make sure your prepared for shopping in a foreign shopping market. Lastly, there are food and drinks available here. So take breaks, get some food…and don’t forget to drink lots of water to manage the heat. If you are a traveler or a backpacker, chances are that you will be heading to Khao San Rd. at some point during your trip. This is a tourist magnet with lots of cheap guesthouses, restaurants, bars, and street stalls with clothes, food, mixed drinks, and so much more. Although it’s really touristy (and expensive), it’s a rowdy and fun atmosphere for travelers and should be experienced at least once while visiting Bangkok (even just for people watching). Getting There: Khao San connects Chakrabongse and Tanao roads, just off Ratchadamnoen Klang Road. All taxi drivers and tuk-tuk drivers know it, regardless how incorrect your pronunciation is. Operating Hours: All day everyday. Tour operators and food stalls open in the mornings, but at night the music and atmosphere gets louder. The streets can get a little crazy until 11 or 12, when things start to settle down a bit. Also known as the “Train Market” this is a cool night market in Bangkok that you should go to. Filled with antiques and a unique vibe, it’s a great place that is a little off the radar as far as night markets go in Bangkok. So you may be able to find some hidden treasures here, and have a unique experience. This is a good market to fill your bags with cheap, fashionable clothes. Also a really good place for late night snacking and people watching! Patpong is nestled in a rowdy district and can be a wild place to be…but it has a lot of shopping too. The street is filled with everything from your typical Bangkok Thailand tourists souvenirs, and surrounded by Go-Go bars. One thing to note is that you will be harassed to buy drinks or go see a “Ping Pong Show” (use your imagination on that one). While you may be interested in buying a drink, the “show” is a scam. Just say “no” to them and continue on your way – usually they won’t continue to bother you. But there’s always another one 10 feet away. Travel Tip: Don’t go see the Ping Pong Show. Even if you are into that sort of red-lightish tourism, it is a ripoff from the moment you say yes or even think about it. They’ll getcha for a lot of money in the end! A great place to come and get some cheap wholesale items from colorful shirts, jewelry and a lot more. You will save money shopping here and there is a lot to choose from. Hungry? Come to this market and be overwhelmed with all the great smells. Here you will be able to find some cool clothes as well as some cool kicks for a reasonable price. Related What makes a Great Travel Souvenir? The Siam Center and Siam Paragon are located right next to each other and is one of the trendiest shopping malls in Bangkok. Both have similar styles, but Siam Paragon will have the more high end fashion shops to go shopping. Walking through both is like walking through a trendy, quirky art gallery. &nbsp;Also, Siam Paragon is where you will find the Bangkok Sea Life Aquarium! If you are looking to be a trend setter and have money to spend, this is definitely the place to shop. Getting There: Centrally located in Bangkok. Take the BTS to Siam and you’re there. This is one of the most well known malls in all of Bangkok. If you like designer brands then this is the place for you to go shopping. 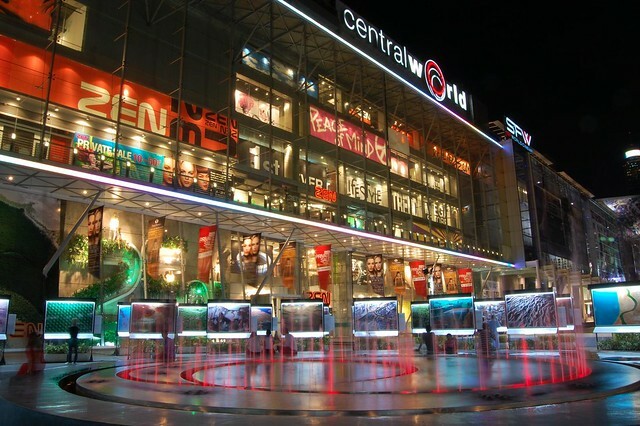 Central World also has a number of fantastic restaurants. This is your high end shopping & eating destination in Bangkok (as well as Siam and Paragon). Getting There: Sky train to Siam station or Chit Lom, and a short distance walk. To us, BMK was somewhat like a HUGE outdoor style market, but with air conditioning. We are actually are not fans of malls, but this is one of our favorites in Bangkok. In fact, their advertising says that it’s the most fun mall in Bangkok…and we believe it! With over 7 floors, each floor dedicated to either jewelry, electronics, clothes, food or entertainment. It’s actually a huge mix of different kinds of shops. With so many stores packed into each floor, it’s easy to lose your sense of direction sometimes. But you should be able to find all kinds of affordable priced souvenirs and other goods to bring home with you. On the upper floors, they have tons of restaurants and a bunch of different video arcades, as well as a movie theater, bowling alley, and even an “escape room” attraction. This really is a fun and affordable mall that most travelers will enjoy spending some time in (even if it’s just to escape the heat for a few hours). Getting There: Sky train to Siam or National Stadium station, and a short walk to BMK Center. Looking for some cheap electronics? Save time searching and come here. This is THE electronics shopping mall of Bangkok. If you are traveling and need some work done on your electronics, this is also the place to get it done. With so many floors, it can be a bit overwhelming. So we recommend having a plan before going inside about what you are looking for, and about how much you want to spend. How to get here: From BTS Chidlom, either hire a tuk-tuk/taxi or walk ten minutes down Ratchadamri Road past Central World on your left, over the Saen Saeb canal and then left on Phetburi Road. Walk about two blocks, and Pantip Plaza should be on your left. Opening hours: 10 a.m. – 9 p.m., but the best time to go is mid-day as many of the smaller shops opens later and closes earlier. If you are looking to go shopping for products like Burberry, Gucci, and other elite brands, then this is the shopping mall for you. This is yet another high-end shopping mall for travelers in Bangkok. How to get here: Sky train to Chit Lom station. Terminal 21 is one of the most interesting shopping malls we’ve been to. At Terminal 21 you can travel to London, Rome, Istanbul, San Francisco, Tokyo and beyond. Each floor is creatively designed and themed for each of these cities from around the world. There are tons of boutique shops here where you can find some trendy, and interesting clothes. You will find a few name brand stores scattered through it like H&M and Nike, but mostly it’s small boutique stuff. In fact, some stores are even more like craft stores where they are making or customizing items right in the shop. There is also a massive food court with amazing foods from all over the world, as well as a movie theater on top. How to get here: Sky train to Asok station. Opening hours: 10 a.m – 10 p.m. Check Out Our Complete Thailand Travel Guide to Plan Your Trip!